Juicy pomegranates, lively fish, sea-creature-inspired vessels, and characters from pop culture and Greek mythology captivate visitors in Exuberant Earth: Ceramics by Ruth Rippon, an exhibition honoring the Sacramento ceramist's remarkable career. Rippon’s humor and zest for life are evident throughout this exhibition. If it’s nature you want, marvel at Sea Urchin Casserole, or Waterfall Monolith I. While Rippon loves nature, she is also a fan of ancient mythologies. 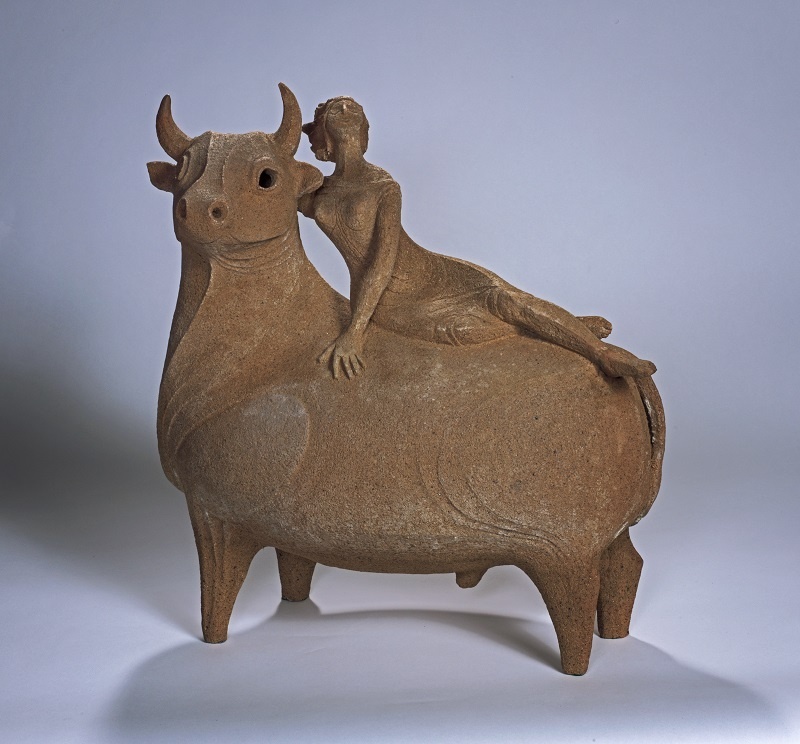 Don't miss Europa and the Bull for a whimsical homage to the Greek myth of Zeus and Europa, when the god disguises himself as a white bull and carries the beautiful mortal, Europa, off into the sea. Rippon's insatiable curiosity did not end with nature and ancient myths. She was inspired by the Pop Art, Funk Art, and Minimalism movements of the '60s and '70s, evident in her ABC Blocks, First Ladies Blocks, and Peep Show series. Straying from the seriousness of Minimalism, however, Rippon reveals a more playful commentary in her pieces. Ruth Rippon, First Ladies Blocks, 1968. Stoneware, 5 cubes: 8 3/4 x 8 3/4 x 8 3/4 in. (each), 2 die: 5 x 5 x 5 in. (each). Collection of Cathie Neagle Fobes. This exhibition and its catalogue are made possible through the generosity of the Creative Arts League Sacramento, an organization co-founded by 10 women in 1952 to bring outstanding works of local, contemporary artists to the community. Ruth Rippon joined CALS in 1957 and she remains a prominent member of the organization 60 years later. Visitors who would like to see more of Ruth Rippon’s ceramics can also check out Sacramento City College’s exhibition, The Rippons (The Work of Ruth & Tom Rippon). Exuberant Earth: Ceramics by Ruth Rippon closes at the Crocker Art Museum on February 4, 2018. Cover photo: Ruth Rippon, Europa and the Bull, 1964. Stoneware, 23 x 21 x 11 in. Crocker Art Museum, gift of Mrs. George W. Bullen.